Almost-New Vehicles (7) * Vehicles under 2 years old with under 20 000 km. 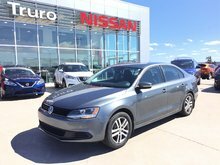 2014 Volkswagen Jetta Sedan TRENDLINE 160 Point Certified! Have you found your vehicle? Allow us to contact you so we can help you find the vehicle of your dreams! I wish to receive recalls, news and promotional emails from Truro Nissan.